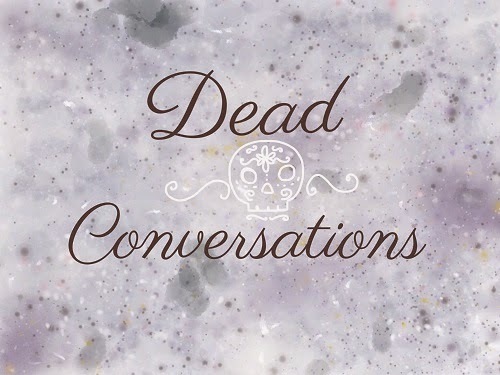 Dead Conversations: FAQ: Do Any Ghosts Scare You? FAQ: Do Any Ghosts Scare You? Ooooh yes. I have waited until I am near a horror of a ghost to write this post. I hope it answers your question, but I also hope it does not deter you from your searching. This is a very rare occurrence - I have seen ghosts since I can remember, and I can count on my fingers and toes how many scary ones I've come into contact with. I'm working on a reading right now, using Tarot and mostly spirits to give answers to people that need them during this dark time of year. SADS and money and speculators trying to kill the economy - strikes and anger. People need solace, they need answers. I try to give them as clear and helpful answers as I can - and with that comes deep conversation with the dead. Among the spirits I contacted, there is one spirit that is choking me with its presence.. not literally, but pretty close to it. The really bad ones will haunt you from the inside. This one floods the room with a feeling of being watched - of feeling intense fear that is unshakable. At night it looms over my bed and waits till I'm near sleep to scare the crap out of me (not literally thank goodness) - emotionless and tireless, just a bit taller and skinnier than a human should be - and it doesn't emit sound, it's like a black hole of sound. The room gets really quiet. It emanates a feeling of panic, like the house is underwater and there's only a few minutes to get out. It's so hard to describe, I hope I'm doing a good job. It doesn't want me to finish this reading, which makes me want to finish it even more ;) - I mean, if that's not a sign of an important reading, I dunno what is. Other ghosts are put off by this one. It's so inhuman! It doesn't take the shape of a person exactly, but it looks like it's trying but maybe forgot how or why it does it. I'm curious yet I keep a respectable distance from it, as I really am chicken when it comes to juggernaut ghosts like this one. Of course this is not the scariest ghost I've heard of, or briefly seen. I've been blessed as a medium in that aspect! Many horror movies, shows, stories - they include ghosts or monsters that grab the heart and squeeze or try to take it out of your chest. It happens, just not literally. These spirits strike a chord in our hearts much like a sad movie or a crying child does to its mother. These spirits remind us that the afterlife is not always picturesque. Ghosts are not always friendly. Most of the time, both wonderful, but once in a while a soul does not let go anger or frustration. It is important to remember: do not life with a ton of regrets and repression. Unload to your priest in confessional, therapist, Minister, Imam, school counsellor, Rabbi, friends, shaman, whatever spiritual guide you have, even your tax preparer or interior decorator if need be and relevance be - but don't live your life with hate and repression of hard emotions - otherwise there's a small chance you'll end up for a long time in a dark and lonely place like this spirit. That's what makes me stop being afraid of spirits like this: it's in a limbo of repression, thought cycles of its mistakes and regrets. We have all felt the prison of our repression - we've all felt where the road of repression takes us. We stockpile anger and explode like searing volcanoes, touching everyone around us with our burning emotions. Write in a journal if you have to, a blog like this one, but trust me.. you don't want to be like this ghost. Wandering in the dark until it resolves the pain inside.. but during life it never learned ways to cope with these things. Our bodies are not the only things that feel emotions. Spirits feel them pretty much the same with a few exceptions. They even feel physical pain like an amputee feels a ghost limb, rare, but usually part of more repression, or identifying one's personality with physical condition. I'll have more on self image and spirits later. This is about if a spirit scares me. This spirit makes me scared on so many levels. For one, it's really scary looking. Has it worked hard on this form or has it just naturally assumed this alien shape? It's tall and lanky and has too many bends in the wrong places. Its back is curved, it is a very dark blueish shade of ash. It moves unnaturally. But the image and the panic it broadcasts is not the big thing that scares me, what scares me most is that I can't help this spirit. It won't listen to me, and it doesn't speak to me. It won't let go yet. I have great faith that it will find and open up to help.